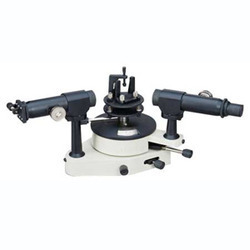 • The spectormeter consist of a telescope and a collimator mounted on a stable Heavy Cast Iron Base, with levelling screws. Circular scale is provided with verniers to read the position of telescope in degrees. In the centre is a prism table made of brass on which prism or diffraction grating can be clamped. • Main Circular Stainless Steel Scale divided in half, from 0-360°. • Circular vernier divided in 30 or 60 divisions such that 30 or 60 divisions of vernier coincide with 29 or 59 divisions of the main circular divisions. • Collimator consists of a tube mounted horizontally on the arm of the Spectormeter. The focal length of the Achromat Lens (approx. 7”) is almost equal to the length of its collimator tube. The distance between the slit and the lens can be changed by a rack and pinion arrangement to obtain parrallel rays. • Slit consists of two sharp edges one is fixed while the other can be moved parallel to it by working the screw at the side of the support. • An astronomical telescope having an Achromatic Objective of 7” focal length and a Ramsden’s Eye Piece with fine glass cross line graticule. • Prism Table consists of two circular disks separated by 3 springs through which pass the leveling screws of the prism table. The height of the prism table can be adjustable by a clamping screw on its side, which fixed the prism table to the venires. The table can be rotated about a vertical axis and may be fixed in any desired position by means of the clamping screw, provided at the base. When this screw is fixed another slow motion tangent screw can give fine adjustment to the table or venires. Nicely packed in Wooden Box. Incepted in the year 1988 at Ambala (Haryana, India), we “Sunil Brothers” an ISO 9001:2008 certified company, are known as the reputed manufacturer and exporter of premium quality range of Laminar Air Flow, Laminar Air Flow Bench, Biological Safety Cabinet, Fume Hood, etc. Under the direction of Proprietor, “Sunil Dhiman,” we have ranked amongst the prominent organization in the industry. We export our products to all over the world.